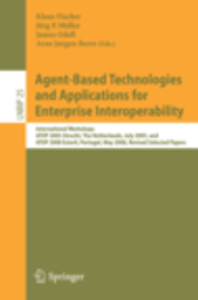 This paper presents a software architecture for inter-organizational multiagent systems. The architecture integrates Web service technology into multiagent systems to overcome the technical interoperability problem of current multiagent systems in the fast growing service-oriented environments. We integrate Semantic Web technology to make multiagent systems semantically interoperable. We address the problem of interoperability regarding interfaces, messaging protocols, data exchanged, and security whilst considering a dynamic e-business environment. The proposed architecture enables service virtualization, secure service access across organizational boundaries, service-to-agent communication, and OWL reasoning within agents.